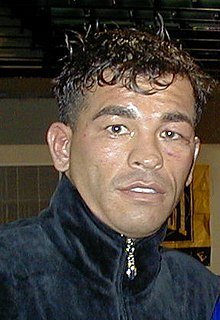 Arturo "Thunder" Gatti (April 15, 1972 – July 11, 2009) was a former Canadian professional boxer. Gatti was born in Italy. Gatti was considered by many boxing experts and fans alike to be one of the most exciting boxers of the modern day. He participated in Ring Magazine's "fight of the year" a total of four times (1997, 1998, 2002, & 2003). Hasta la vista, baby. I can't take this abuse anymore. I'm coming back - as a spectator. I'm retired. anouncing his retirement to the world after been defeated by Alfonso Gomez. I have the heart and what its got to be champion and I did it, I proved it tonight again. being interviewed after a dramatic comeback KO against Wilson Rodriguez. This page was last edited on 17 January 2019, at 17:28.